Latest News » Articles & Blogs » Leanne Clifford, Winter Nuts Challenge 2016 CHAMPION! Leanne Clifford, Winter Nuts Challenge 2016 CHAMPION! But enough about me! Today was all about Leanne Clifford, who only went and WON the female category of 4 laps, the single toughest obstacle race in the whole country! Incredible! This was a tough race in tough conditions, people were dropping like flies! Dave Loveridge, Sarah Greene and Victor managed to finish their four laps also, but Dave Peters succombed to the cold after 3 laps, Kerry Gowen‘got bored’ after 3 laps (her words, not mine! ), and just countless other victims to this brutal physical and mental beatdown throughout the weekend! Ok, so I have yet again managed to not finish this race either… Not even halfway through lap 1, about 30 minutes in I think, I was going over the ‘Full Monty’ obstacle (a bunch of beams you have to climb over) and halfway through jumped down onto a hidden small tree stump, twisting my right ankle. Annoyed! While I was sat there getting attended to by the medics they dug the stump up and removed it, because it actually wasn’t supposed to be there… But luckily I found it for them before anyone else could do a mischeif! So while I’m annoyed to all hell about it, I’m really impressed the speed they dealt with it so others wouldn’t land on it. The race director Wayne Monkman was a very gracious host and felt bad for what happened, gave me a free burger and said he’ll sort me free entry into a future race, bless him. Most annoying was I was utterly pooing myself about today, couldn’t sleep at all last night, but then once on the course felt great, relaxed, strong, taking my time to build my stride… Maybe I would have made it to the end, but who knows? I’ll have to wait until next time! Once again obstacle racing demonstrates that it’s a NAILS passtime! So even more props to Leanne! So let’s hear it once more for Leanne! 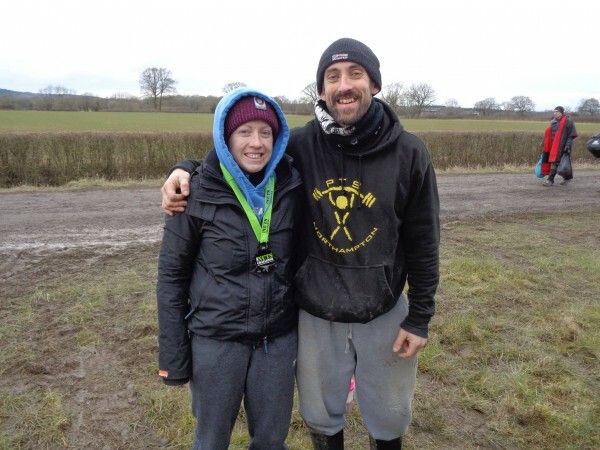 Possibly the toughest female obstacle racer in the country!